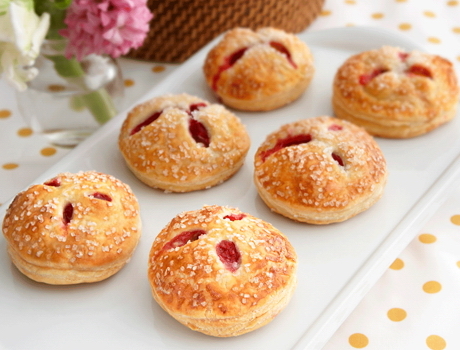 Puff pastry and a delectable filling make these hand pies irresistible. 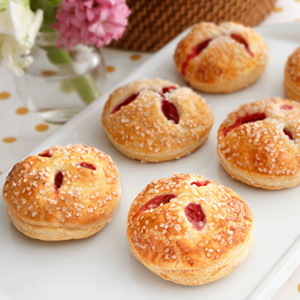 Each bite features fresh raspberries in a white chocolate cream, wrapped in flaky puff pastry...they're simply divine! Sprinkle the flour on the work surface. Unfold 1 pastry sheet on the work surface. Roll the pastry sheet into a 12-inch square. Using a round cutter, cut into 12 (3-inch) circles. Repeat with the remaining pastry sheet. Stir the cream cheese and granulated sugar in a medium bowl until the mixture is smooth. Stir in the white chocolate chips. Brush the edges of 12 pastry circles with the egg mixture. Place about 1 tablespoon cream cheese mixture in the center of each. Top each with about 3 raspberries. Place the remaining pastry circles over the filling. Press the edges firmly to seal. Crimp the edges with a fork. Brush the pastries with the egg mixture and sprinkle with the coarse sugar. Using a sharp knife, cut small slits in the tops of the filled pastries. Place the pastries onto 2 baking sheets. Bake for 20 minutes or until the pastries are golden brown. Remove the pastries from the baking sheets and let cool on wire racks for 10 minutes. Ingredient Note: Coarse white sugar is a coarse-grained sugar that adds a wonderful sweet, crunchy finish to baked goods. You can find it in the baking section of most specialty food stores and in select grocery stores. Flavor Variation: You can substitute 36 frozen sweet dark cherries, thawed and well drained, for the raspberries in this recipe.